Product Overview Every PC builder wants to customize their system to be aesthetically pleasing, and they want components that are elegant yet unique --but looks can only get you so far. There’s a demand for unique looking parts that can also deliver performance and we have just the thing! We’re proud to introduce the Black Vortex MB074SP-1B. The Black Vortex MB074SP-1B is a hot-swappable 4 bay 3.5” SATA HDD cooler cage built robust from durable metal. It has many configurable options such as fan speed control, fan LED brightness control and power button for each of the drive bay. The hot swap function and EZ-Grip handles give you the ability to swap drives without breaking a sweat. The quiet 120mm cool blue LED fan combined with all metal ventilated design keep your drives cool, lowering your overall system temperature and thus increasing your hard drives’ life span. The removable dust cover prevents dirt and dust from entering the case. The Black Vortex MB074SP-1B is a must-have HDD cooler cage for any PC builder seeking quality components with a ton of features and rugged good looks.. The core of the Black Vortex’s design is to include all conceivable hard drive cage functions and have them easily accessible from the front panel for an effortless configuration. The cooling fan, fan speed control, fan LED brightness control, drive power button, dust filter and hard drives can all be accessed from the front so you can easily configure the HDD cooler cage without opening up the case. The space saving design converts 3 x 5.25” front bays into 4 x 3.5” hot-swap HDD bays. It also uses only two 15 pin SATA power connectors to power up all 4 drives, reducing power and power connector usage. Individual drive power buttons allows you to power down the drives you don't need to effectively extend your drives' life span and to prevent data vulnerability from unknown viruses such as Cryptolocker. The Black Vortex MB074SP-1B gets its name from the whopping 120mm fan integrated in the unit, which allows it to efficiently cool the drives and improve the air flow of your entire system. The included 120mm fan effectively pulls cool air from outside the system resulting in a lower overall temperature which prevents performance decrease from overheating drives. We’ve included an adjustable 3 settings fan switch (high, low, and off) to allow you more control over your system performance and noise levels. The Black Vortex features an adjustable built-in LED lit fan that brilliantly Illuminates your case and provides an ambient blue color. It’s a surefire way to grab the attention of everyone in the room whether you’re at a LAN party or just inviting guests over. The 3 different brightness settings (high, low, and off) allows you to dim and brighten the LED fan with a simple touch. The 120mm cooling fan can be easily replaced to an aftermarket 120mm fan with 3 pin connector. Finally, the included removable dust filter can easily be removed and cleaned within a matter of seconds. Drive installation has never been easier with the EZ-Grip handles. Installing EZ-Grip to your hard drive only requires two screws. Easily slide your drive into the Cage and lock the switch, once they’re locked in place, they’re not going anywhere. The EZ-Grip handles are compatible with our lineup of portable docks such as the MB881 and MB981 HDD docking stations. You can quickly remove your drive from the Black Vortex, and insert them into our docking stations without removing the EZ-Grip handles. This is extremely useful when transferring data in between systems. The EZ-Grip handles are also compatible with our 2.5” to 3.5’ HDD/SSD converters: EZConvert MB382, MB882 & MB982 series, allowing you use your 2.5” HDD/SSD with the Black Vortex hassle-free. It’s just not an ICYDOCK product unless it’s been fine tuned to incorporate all of our customers’ needs. You’ve voiced your concerns, and we’ve added features based on your requests. We’ve made the protruding handles removable so it will be compatible with computer cases that have front doors. For system builders that are concerned about loose power connections to the unit, we’ve also added our customized locking latch that will firmly clasp onto any 15 pin SATA power connector with the locking mechanism. Once connected, it’ll stay secure until you decide to remove it. The Black Vortex is made by full metal frame that complements any computer chassis. Crafted to be ruggedly stylish and extremely robust, the Black Vortex is meant to endure the harshest conditions. Your drives are guaranteed to be protected when they’re enclosed in a full metal surrounding. The symmetrical web-like pattern adds a dash of flair so you can be confident that your system will turn heads. 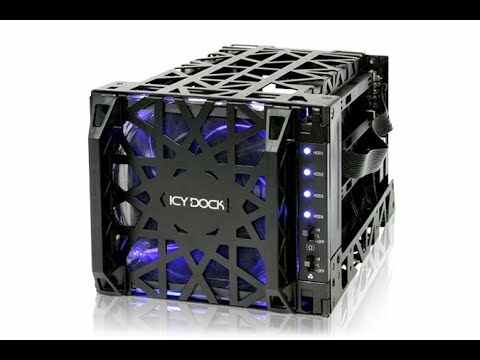 Icy Dock MB074SP-1B Black Vortex 3.5 HDD 4 in 3 Module is rated 5.0 out of 5 by 1. Rated 5 out of 5 by Raider1 from Excellent product and good features Fitted this into my Mozart TX and worked perfectly.